Heading north on US 23 you will come to the roadside studio and gallery of artist R.S. Jaworowski of Bear Crossings. 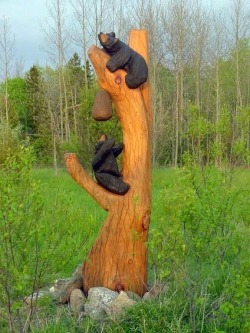 The handmade, custom, wood carvings will undoubtedly catch your attention. 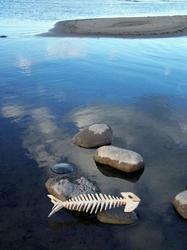 Whether it is the fish bones, bears, totem poles, or sailors you can't resist stopping to get a closer look. Many times you will find the artist on-site working on a custom piece. It is an amazing sight to see a simple piece of wood sculpted into a spectacular work of art by just a man with an artistic vision and chainsaw.